Welcome to the Holiday Inn Express Hotel & Suites Galleria Area. Located 30 minutes away from Sacramento International Airport,Enjoy our local attractions such as Daffodil hill, Folsom Lake, Maidu Indian Museum. Other attractions include Golfland Fun Center & Water Park, Magic Circle Theatre, All American Speedway and Red Hawk Casino. You can shop at The Westfield Galleria Mall, Walmart, Target, and Frys Electronics or catch a movie at Century Roseville XD /3D Theater. Pick up some local produce and crafts at Denio's Farmer's Market. Enjoy fine dining at our many restaurants Olive Garden, BJs Brewhouse, Chicago fire Pizza, Tahoe Joes, Outback or Ruths Chris Steakhouse. Sacramento is a short drive away, so explore the State capital and Historic Old Sacramento during your stay. With convenient access to companies such as Adventist Health, Surewest Communications, Union Pacific Railroad, Hewlett-Packard, State Farm, Sutter Medical, Kaiser Permanente, Pasco Scientific. 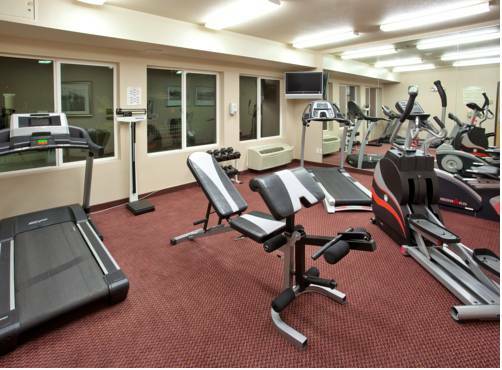 Be sure to enjoy a swim in the outdoor pool, surf the net with free high-speed Wi-Fi access or work out in the Fitness Center or take a run on our scenic Jogging trail - Miners Ravine. You can eat well every morning at the Complimentary hot breakfast bar featuring our famous cinnamon rolls along with other healthy options. Need a coffee fix? Starbucks is across the street. Check out our great hotel!! Childrens's program - Roseville Golfland Sunsplash: Play over 200 video games, challenge your friends to a game. SunSplash Waterpark Vortex, Revolution and StormRider are three progressive bowl type slides that are ridden solo or with friends. Placer Room: Perfect for all meeting needs from trainings to depositions. Room features Free high speed internet access, phone line, TV with DVD/VCR, & projection screen. Professional setting with two sets of windows to provide excellent natural lighting.